Over the last few weeks we have been creating some new marketing materials. One of our goals is to make it easy for each of you to help spread the word about COMC.com. Your voice carries much more weight than ours. The whole reason behind the name of our website was that we wanted each of the sellers to tell people “check out my cards!” Now we are giving you a great tool for doing this. 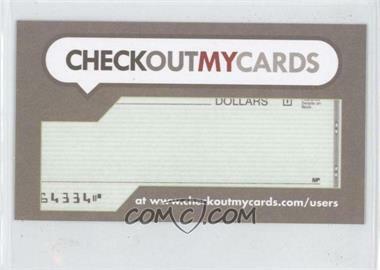 These business cards are designed to look like a cut signature card where you have a blank to enter your user name. 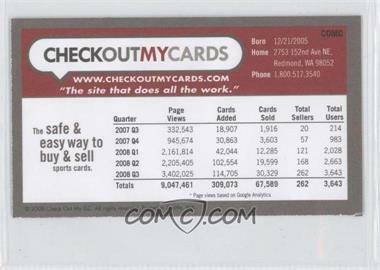 The back of the card is modeled after a baseball card with some statistics about the website. We will be including a few of these in each order that we ship out. We will also bring them to card shows. You will be welcome to grab as many as you would like, and you can even order them from the website. Also, I’m not sure if you’ve heard of Moo.com. They can do business cards based off Flickr.com images or your own uploads. I’ve heard of some people doing really creative things there too. I love your idea here of empowering your users. Great! We need a MESSAGE BOARD!!!!!!!!! It will help users who are on here daily know what other collectors are looking for! It would also be nice to see a transaction link. I know we all would know what other cards are going for and the more popular sport(s)/brand(s)/player(s)/year(s) of card that is getting sold. Can I get anyone else to agree with me on this, or atleast feedback from COMC as to why they can’t or won’t provide this??? Thanks! Sorry it has taken me so long to respond to this request. I have started a reply a couple times, but I always get side tracked. We will not likely offer a message board or forum directly on our site. However we have set up discussion boards on our facebook page. You are welcome to start using them. We will soon add a link to them from the footer of our site. Regarding what has sold… I am putting together some pages that show our 100 hottest (players, sets, years, cards…). Those should be on the site by the end of the month. How about getting more sub categories under each header? For example, group the autos, memorabilia, rookie cards, etc into sub categories and grouping years together like 1950’s, 1960’s etc. Making cards more easily accessible would greatly enhance the value of the site and speed up searches. Lastly, how about notifying users about which other users have posted new items each day? Just some suggestions! Love the suggestion. We will see what we can do.